Isabelle from Canada describes herself as a skeptical person. What she says about a moldavite flush and her experience? 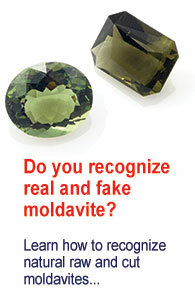 I really did not know what happened to me until I googled moldavite more and read about the so called flush. I am generally skeptical so I was wondering why I felt “high” all of a sudden, ears ringing, vibrations all over. Since I was not even aware of that fact at the time it was not all in my imagination! I am wearing pieces all the time now and I feel that it is improving my mood for some reason. I was very surprised. Some pieces are definitely more vibrant than others. I came across moldavite by accident. I originally got a jade whetstone that contributed to the clarity of my dreams. Although it is recommended to place moldavite on your 3rd eye and heart chairs, I had an urge to place it below neck. For some reason there is an information against meditating on Gia Pe, Ta Chui and Jade Pillar. The best way to wear on my body is in gloves attached to the shoulders. According to Zulu tradition, these areas should be protected from the sun to retain clairvoyance powers.